Background: Inflammation is defined as the response of immune system cells to damaged or injured tissues. The major symptoms of inflammation include increased blood flow, cellular influx, edema, elevated cellular metabolism, reactive oxygen species (ROS) nitric oxide (NO) and vasodilation. This normally protective mechanism against harmful agents when this normal mechanism becomes dysregulated that can cause serious illnesses including ulcerative colitis, Crohn’s disease, rheumatoid arthritis, osteoarthritis, sepsis, and chronic pulmonary inflammation. 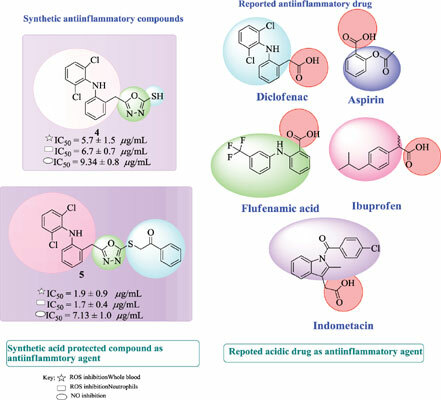 Method: In this study synthetic transformations on diclofenac were carried out in search of better non-steroidal antiinflammatory drugs (NSAIDs), non-acidic, antiinflammatory agents. For this purpose diclofenac derivatives (2-20) were synthesized from diclofenac (1). All derivatives (2-20) and parent diclofenac (1) were evaluated for their antiinflammatory effect using different parameters including suppression of intracellular reactive oxygen species (ROS), produced by whole blood phagocytes, produced by neutrophils, and inhibition of nitric oxide (NO) production from J774.2 macrophages. The most active compound also evaluated for cytotoxicity activity. Results: Diclofenac (1) inhibited the ROS with an IC50 of 3.9 ± 2.8, 1.2 ± 0.0 µg/mL respectively and inhibited NO with an IC50 of 30.01 ± 0.01 µg/mL. Among its derivatives 4, 5, 11, 16, and 20, showed better antiinflammatory potential. The compound 5 was found to be the most potent inhibitor of intracellular ROS as well as NO with IC50 values of 1.9 ± 0.9, 1.7 ± 0.4 µg/mL respectively and 7.13 ± 1.0 µg/mL, respectively, and showed good inhibitory activity than parent diclofenac. The most active compounds were tested for their toxic effect on NIH-3T3 cells where all compounds were found to be non-toxic compared to the standard cytotoxic drug cyclohexamide. Conclusion: Five derivatives were found to be active. Compound 5 was found to be the most potent inhibitor of ROS and NO compared to parent diclofenac 1 and standard drugs ibuprofen and L-NMMA, respectively. The most active compounds 1, 4, 5, 11 and 20 were found to be non-toxic on NIH-3T3 cells. Compound 4, 5, and 20 also showed good antiinflammatory potential, compound 11 and 16 showed moderate and low level of inhibition, respectively. Keywords: Synthesis, diclofenac, 1, 3, 4-oxadiazole, antiinflammatory parameters, ROS suppression, and NO inhibition. Keywords:Synthesis, diclofenac, 1, 3, 4-oxadiazole, antiinflammatory parameters, ROS suppression, and NO inhibition. Abstract:Background: Inflammation is defined as the response of immune system cells to damaged or injured tissues. The major symptoms of inflammation include increased blood flow, cellular influx, edema, elevated cellular metabolism, reactive oxygen species (ROS) nitric oxide (NO) and vasodilation. This normally protective mechanism against harmful agents when this normal mechanism becomes dysregulated that can cause serious illnesses including ulcerative colitis, Crohn’s disease, rheumatoid arthritis, osteoarthritis, sepsis, and chronic pulmonary inflammation.